Could A Diesel Ban In Hamburg, Germany, Cause More Pollution? Some Residents Worry : Parallels The partial ban went into effect Thursday. Many Germans question whether the ban is an environmental milestone or a political shell game that could end up creating more pollution. A road sign on Hamburg's Max-Brauer-Allee warns motorists that older diesel vehicles are banned from using this stretch of road. Hamburg is the first German city to ban older diesel vehicles. Hamburg officials predict the inaugural ban — affecting the use of vehicles with older engines on 1.4 miles of two of the city's busiest thoroughfares — will help bring Germany's second-largest metropolis into compliance with European Union diesel pollution limits and reduce toxins that government scientists say kill thousands of Germans each year. "We don't want to implement more restrictions than reasonable and necessary," said Jens Kerstan, the Hamburg state senator for energy and environment. He said there are other initiatives underway to curb pollution and reduce traffic in Hamburg, including expanding and modernizing the public transit network. Charlotte Lill, 71, lives in a high-end retiree complex off Max-Brauer-Allee, one of the Hamburg streets affected by the partial diesel ban. She says as lucky as she was to be assigned an apartment with a balcony, she barely uses it because the fumes from the road have made her feel sick. But critics of the ban are crying foul. Many Hamburg residents and business owners accuse their city of trying to score political points by being the first to impose a ban, after Germany's top administrative court on May 18 gave municipalities the green light to do so. Hamburg's government prides itself on being environmentally conscious, and being first with the ban makes it look proactive and responsive to residents' concerns about air pollution. The critics argue that Hamburg's partial ban — which officials estimate will reduce traffic by about 6,000 cars per day, or one-fifth the usual number of cars on those streets – will lower the readings at air quality monitoring stations in the ban zone, but will generate more emissions elsewhere because drivers will spend more time trying to circumvent the area. "They take the pollution to other streets where they don't record anything. You think that's the right thing to do? I don't think so," said retired businesswoman Charlotte Lill, 71, who lives in an apartment complex on Max-Brauer-Allee, one of the thoroughfares affected by the ban. "The pollution still is here. They need to do something with the cars. There's no other solution." Independent auto analyst Matthias Schmidt told the Financial Times he views the ban as "pretty much a big defeat device," referring to the software used illegally by Volkswagen and several subsidiaries to get lower readings on diesel emissions tests, which led to a worldwide scandal in 2015. But Kerstan rejected claims that the city was trying to game the system, even though he has his own reservations about the partial ban. For instance, how will Hamburg police be able to tell which cars are allowed in the zone and which are not? "That's a big problem, because you can't tell from the outside if a car is a diesel or not and what kind of diesel," he said, and whether it has a newer, compliant engine. "So the police will have to control on certain days and stop all of the cars and get them to show their papers ... Of course you can't do that every day, but after a few times, we figure that people after that will obey the ban." 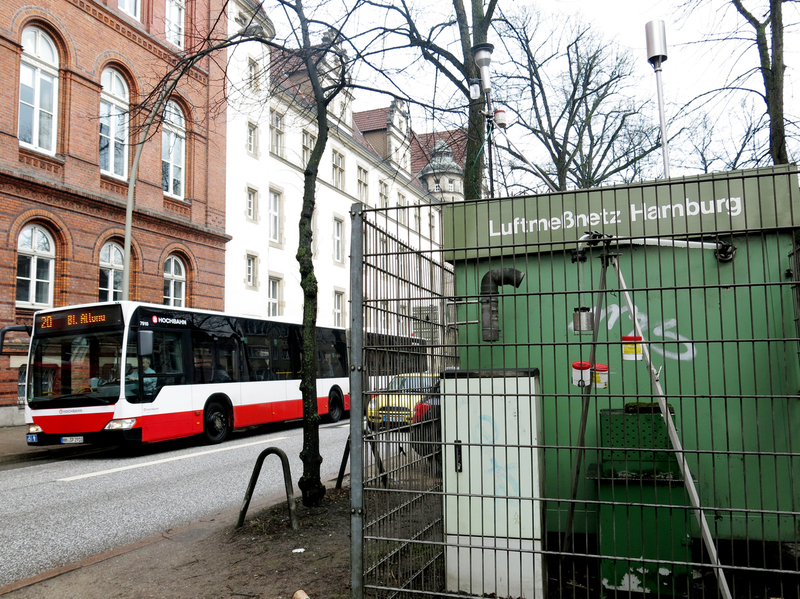 This air monitoring station on Max-Brauer-Allee, one of the streets now off-limits to most diesel vehicles, is one of 18 in Hamburg that measure nitrogen oxide levels. Nitrogen oxides are present in vehicle exhaust. Kerstan said the city can't issue stickers certifying cars not affected by the ban without approval from the federal government in Berlin, which so far has not provided it. Another issue is that the fine that violators of the ban will pay may be too low to serve as a disincentive — it is $29. Any meaningful increase would also requires federal intervention, Kerstan said. 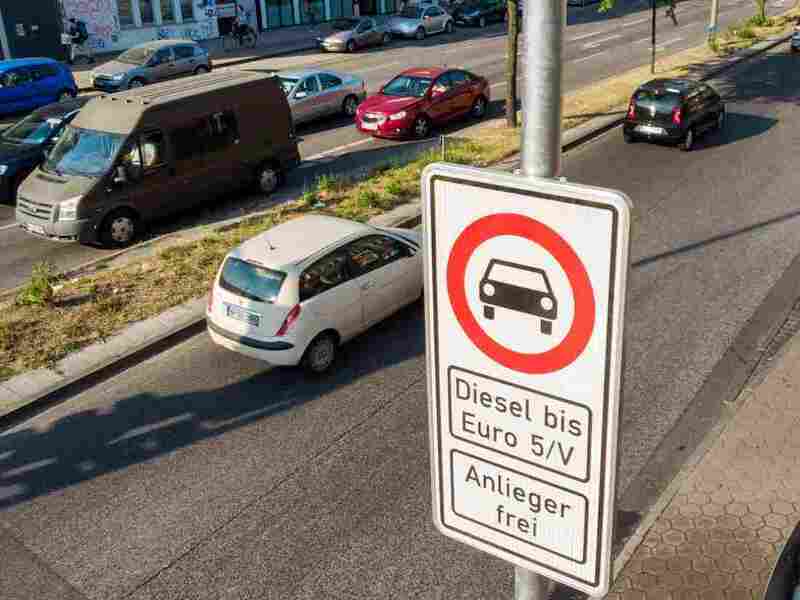 He and other proponents of diesel vehicle bans in Germany say the idea isn't just to target drivers, but also to increase the financial pressure on car makers to improve their diesel technology or speed up their rollout of electric cars. 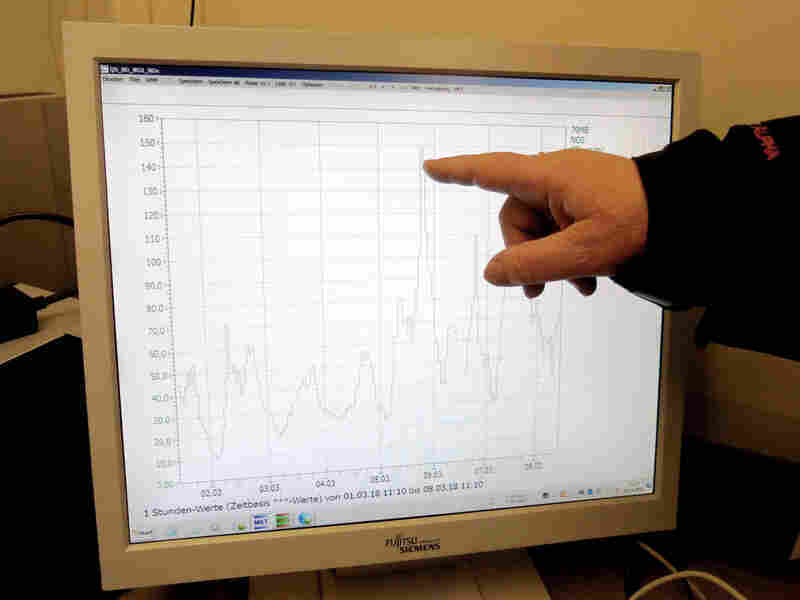 This console inside the air monitoring station on Max-Brauer-Allee in Hamburg shows excessive nitrogen oxide levels during measurements in March. 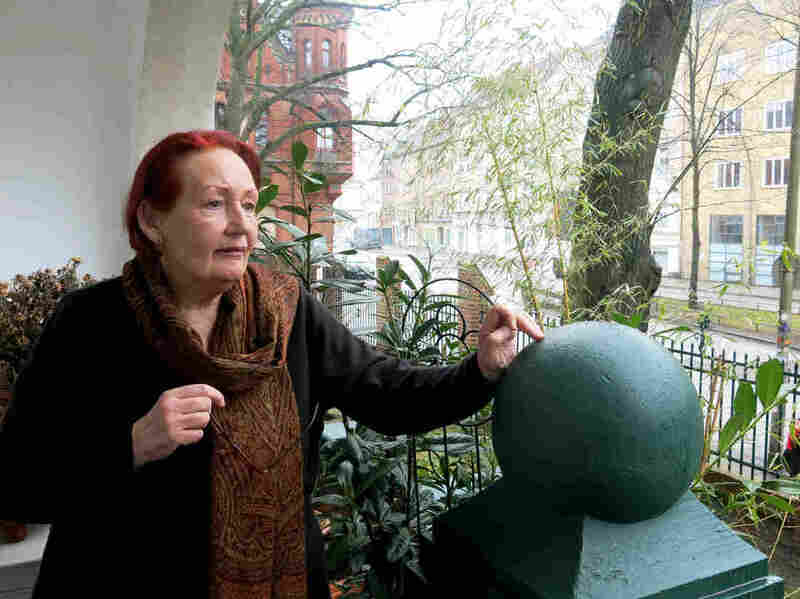 Lill, who formed a nonprofit group with her neighbors to push for better and cheaper public transit in Hamburg and a car-free downtown, said the problem is that Germany is too economically dependent on its auto industry for the government or the courts to force the manufacturers to act. Car manufacturing accounts for one-fifth of industry revenue in Germany and provides some 800,000 jobs. "They are afraid that the jobs may go down," she said. But "you shouldn't, you know, forget about the pollution to save jobs." Stefan Meyer, who owns a house painting business, also opposes the new partial ban, but for different reasons. "They've found someone they can stick it to — namely, we diesel drivers," he complained. 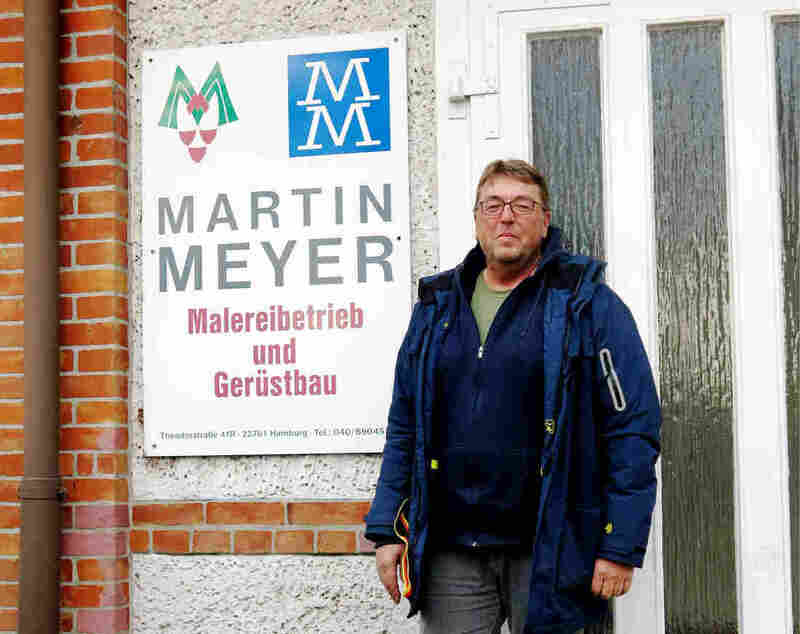 Meyer said his painting business depends on his fleet of 10 older diesel vans, and that a better solution would be for Hamburg to improve the flow of traffic rather than keep him and other businesses from getting to their clients. "Traffic was already slow and stationary in the affected area because earlier, they converted two lanes into a bus lane, which means all trucks and cars were not moving and spewing smoke," he said. With the ban, he expects traffic will become even worse. He added that replacing his work vehicles with newer, non-diesel ones would be prohibitively expensive. Stefan Meyer, who runs a house-painting business in Hamburg, says the ban will prevent his fleet of 10 diesel vans from using two key streets that lead to his downtown clients. Heike Janssen fears that vehicles diverted by the new ban will end up in her trendy, multi-ethnic neighborhood of Ottensen. Traffic is already stop-and-go on the narrow streets, and the television journalist says she and her daughter suffer from respiratory problems they suspect are linked to diesel fumes. "It is ridiculous because it's so easy to block certain streets. It's not a big solution," Janssen said, adding that a better approach would be for the city to encourage more bicycling — which is how she would prefer to get to work rather than driving a car, as she does now. "We need to have a better bicycle routes because it's very dangerous to [ride] a bicycle in Hamburg," she said. Kerstan said he understands his constituents' frustrations, but added that a more comprehensive ban or other remedies require intervention from Germany's federal government, which, so far, has dragged its feet. "Sometimes we look a bit with envy to the United States, where federal agencies are much more strict in enforcing the rules," he said. "I think that would be a good example for the German government."